Kylie Jenner has done it again with some more stolen Black girl magic. Apparently, Jenner broke the Internet with her much-anticipated lip-kit that sold out in less than 30 seconds. 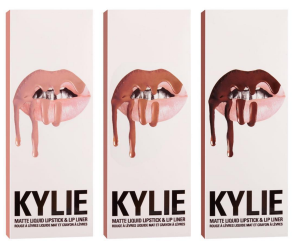 While we applaud Kylie for using her entrepreneurial genius to capitalize off of her famous pout, we can’t help but side-eye the whole thing! It isn’t the first time and it will not be the last time she highjack’s Black girl swag, repackages it, and sells it as her own. For starters, Kylie is well known for copying some of her Black girl buddies, so much so it’s safe to say they’re no longer friends. Kylie caught heat when she replicated her friend Heather Sanders makeup and hair looks down to the very pose. Naturally, Black Twitter has been documenting these replicated looks and dedicated Tumblr and Instagram feeds to calling Kylie out for appropriation, which we are sure she still doesn’t understand. As if getting called out isn’t enough, little Jenner didn’t stop there! She ditched Sanders and found a new Black BFF to style jack, Jordyn Woods. Sadly for Jordyn, the youngest of the Kardashian-Jenner clan, replicated almost every look right down to the aqua colored hair she’s famously known for. Imitation isn’t just the biggest form of flattery, it’s downright copyright infringement. Jenner and her family made fortune on top of fortune stealing Black girl features and selling them piece-by-piece to the masses. First it was her hair; she had everyone running out to buy colored clip-on weaves like she invented that. Then it was the booty she and Kim repurposed and now it’s her lips; deemed the “Kylie pout”. Since when did White girls take ownership of pouts or full lips? We know we can’t expect Kylie or society to give Black women credit for beauty standards, but that doesn’t mean that we don’t peep the trickery!